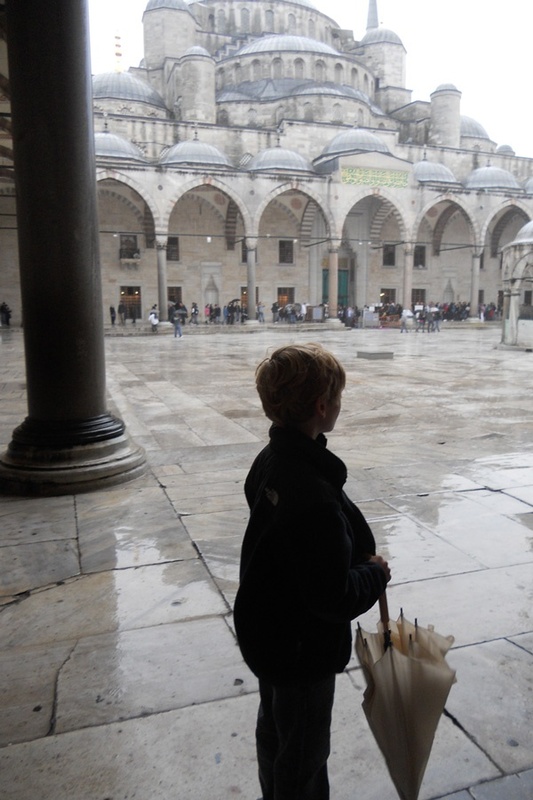 Contributing editor Christina Ohly and her globetrotting family went on a three-day whirlwind of Istanbul. 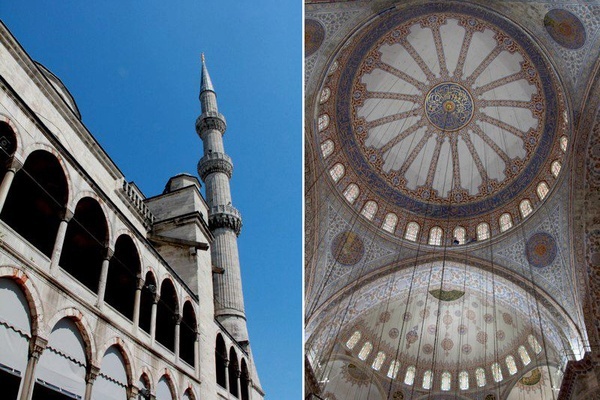 Boat rides, mosques, markets, the Bosphorous — everybody left happy. ISTANBUL, Turkey – It's best to set everyone's expectations before hitting this dramatic city of mosques, minarets, and delicious mezzes. First of all, Istanbul is vast and densely populated (we're talking two times the size of New York City, with a population of 14 million). It is also extremely hilly (a la San Francisco), so if you're trying to see a lot in a few days with kids, you'll want to enlist an expert for help. Among other things, you're definitely going to hit traffic, so planning your days wisely is extra important here. We worked with Lisa Lindblad Travel Design, who did a fantastic job, sorting our guide, hotel, and transfers in advance. (Less on-the-ground stress means happier vacation for everyone.) The guide she picked for our family of four (me, dad, ten-year-old Will, and nine-year-old Kate) was the marvelous Serhan Gungor. He is part political scientist, part art historian, part personal shopper, and all-around foodie. Perfectly suited to the varied interests of our well-traveled family. Serhan met us with our kind driver for the weekend, Ali, whose discreet black van whisked us all over the city for the three absolutely incredible days. Kate and Will on the Bosphorous. We checked into our hotel, The Four Seasons Bosphorous, which is ideally situated on the water, and immediately hit the outdoor patio for a lunch of grilled kebabs, mezzes, and the requisite grilled cheese sandwich (made with haloumi cheese and pita) for the kids. 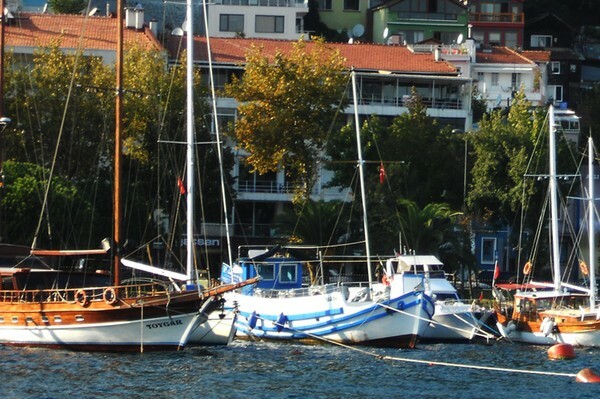 Promises were made for a swim in the hotel pool later that afternoon, and we were quickly whisked away on a private boat tour around the Bosphorous, a 20-mile-long strait which joins the Sea of Marmara and the Black Sea. 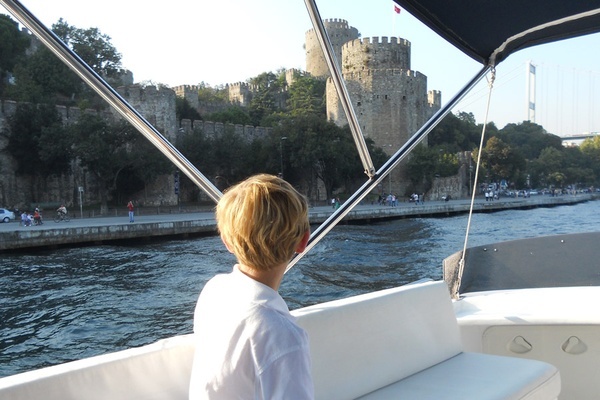 A boat ride is the perfect way to explore the old and new cities of Istanbul, as well as the Asian side. We passed enormous bridges, summer houses of kings, freighters, and outdoor discos. We were all thoroughly delighted. Serhan talked us through the city's complex history as the former capital of both the Roman and Ottoman Empires, as well as Turkey's ever-changing political landscape. Best of all, he managed to make all of that understandable and enthralling for the 40-somethings and the under-10-year-olds alike. Our first evening found us at the bustling House Café, an outdoor restaurant full of Turks and tourists, where festive music and smoke wafted throughout the terrace. (Kids will be fascinated — and righteous — about all the smoking that goes on in this country, so prepare yourself on this topic.) We feasted on thin crust pizzas, grilled sea bass (a local specialty), and delicious sumac and lentil salads. An easy stroll back through neighboring tchotchke shops and a Friday night traffic jam, and we all slept soundly in our slightly sterile yet blissfully silent suite. Will at the Blue Mosque. The breakfast spread at this Four Seasons is of special note, with every imaginable delight from Turkish breads and Japanese specialties to perfect pancakes. And the staff is more than eager to grant your every wish. 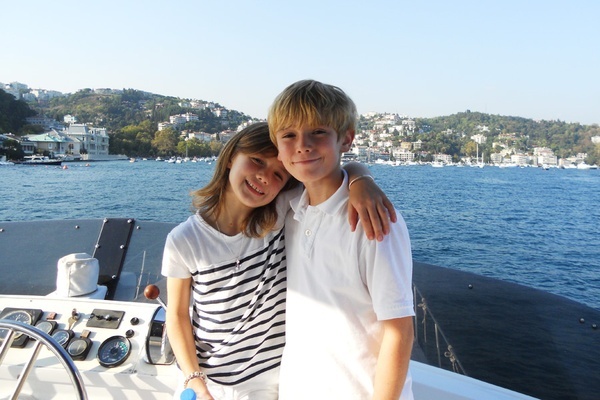 Children are doted on in Turkey, and this is particularly true at mealtimes in a fancy hotel. After a full feast we headed for our first stop, The Sultan Ahmed, which is better known as The Blue Mosque for its beautiful blue tiled interior. Throughout the trip, our kids found particular delight in the calls to prayer that ring out five times per day to call Muslims to pray. These chants change in tempo and tone as the day goes on, so each call held new fascination for our kids. 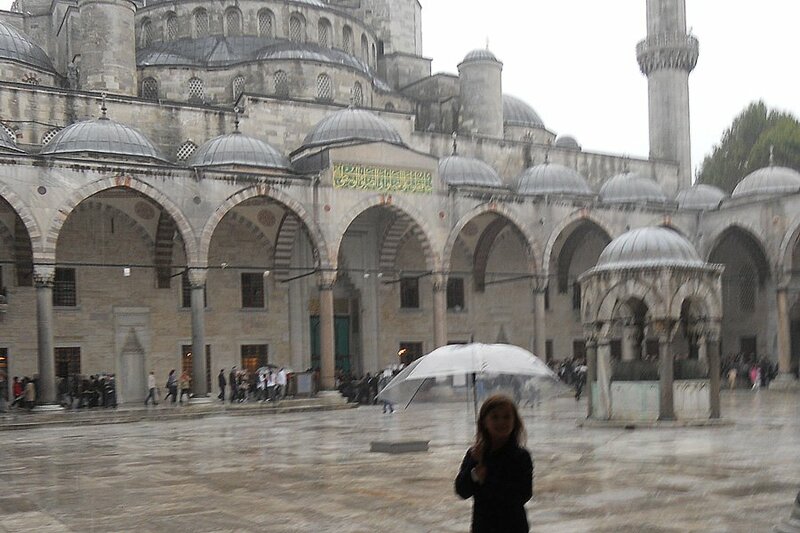 The Blue Mosque was stunning with its Ottoman and Byzantine decorations, floral motifs, and gilt spaces, not to mention the spectacle of thousands of people taking their shoes off in the middle of a rainstorm to enter into the sacred and still functioning mosque. (Note to parents: Pack long pants. This is a Muslim country, and although it is very European in feel, knees should be covered.) The kids loved walking in their sock feet on giant Oriental carpets and seeing the elaborate chandeliers that illuminate this vast mosque. With no time to waste, we headed for the nearby Hagia Sofia, a Byzantine gem that was once a church, a mosque, and is now a museum. No art history course has ever done this one justice, and we were all entranced by its massive dome, endless gold mosaics, and the natural light that floods the space. Serhan led us to a conveniently located (and pre-reserved) lunch spot, Karakol, within the nearby Topkapi Palace grounds. We refueled on more sea bass (when in Rome...), endless mezzes (some unidentifiable, all delicious), and a local favorite, kofte meatballs. And then we went into sensory overload in the Spice Market. We stocked up on everything from tea to Turkish delight candy in delicate rose water and mint flavors, as well as evil eyes — glass charms that are meant to keep the wearer protected from the envious looks of others. We bought them in all forms — necklaces, holiday ornaments, and even pins, which the shopkeepers delight in bestowing upon small children for free. 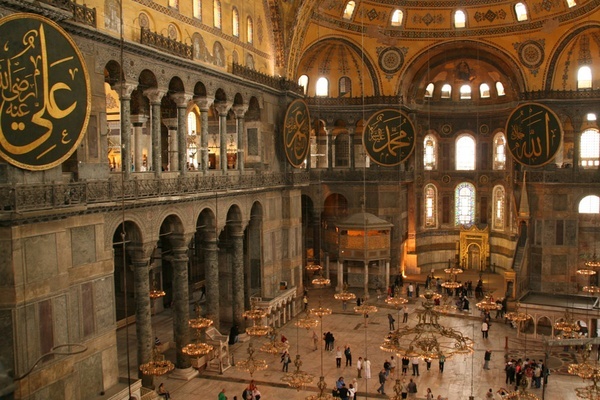 This was followed up by a trip to the Turkish and Islamic Arts Museum. I feared this would push two tired kids over the edge. Instead, we found a manageable museum filled with carpets, intricately drawn Korans, and lifelike recreations of nomadic life. Delightful. After a full day, the kids got to call the shots, so we retreated to the hotel pool. 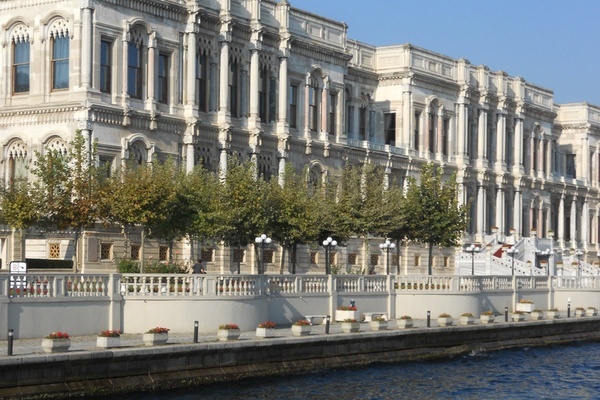 This is no small thing in a hot, crowded city, and it makes the Four Seasons Bosphorous a perfect pick for families, more so than the very urban Four Seaons Sultanahmet in the Old City. Our final stop of the night was Sur Balik, a four-story fish restaurant set in a historical building with distant water views. We loved picking our dinner from the catches of the day (sea bream, lobster, and fried calamari were all winners), sipping ice-cold Turkish raki (well, two of us), and capping it all off with baklava and the freshest figs imaginable. 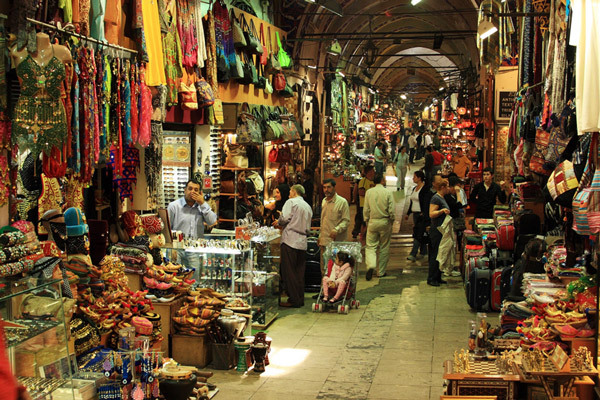 Our third and final day was devoted to shopping the massive labyrinth of shops that is the Grand Bazaar. With more than 60 streets and 5,000 shops, this is not one to attempt on your own. It is, however, the place to score everything, especially fantastic scarves (Ottoamano for hand-painted silks and fatoush shawls) and peshtemal towels (inexpensive, thoroughly modern hammam towels made of fine cotton that make great hand towels). 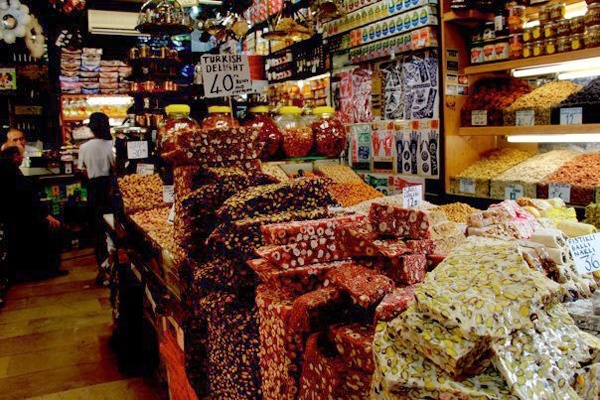 The Bazaar is organized into areas — jewelry, candy, rugs, slippers — which makes targeted buying very easy. My kids had a limited attention span for retail overload, but they did enjoy the haggling part of any purchase. Our third and final night was spent at Ulus 29, a rather fancy restaurant located on a hilltop overlooking the Bosphorus and the bridge connecting the European and Asian sides of the city. This is definitely a white tablecloth-and-chandelier situation, but absolutely worth it for the sashimi and the stunning views. Ulus 29 has a traditional Turkish menu (kids will love their meatballs and mini pizzettes) as well as a full sushi bar with what must be the freshest fish I've ever tasted. After a dessert of homemade sorbets and pastries (even if you say "no, thank you," you will invariably and always be served sweets), we retreated to the hotel through the winding streets of the upscale Ulus neighborhood. 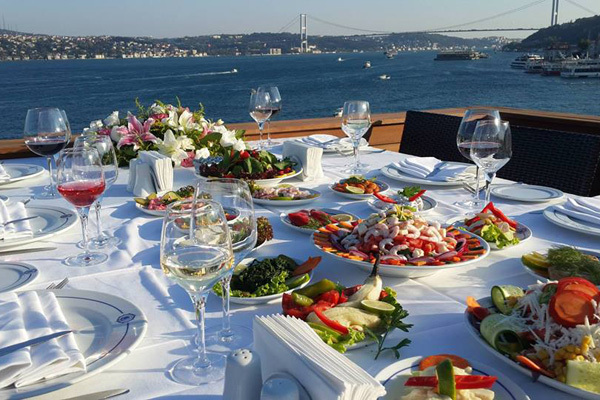 Three days in Istanbul will allow you to taste the European and Asian flavors of the city, and to enjoy the intricate mix of ancient culture and incredible innovation. My mantra holds true: Leave wanting more. Fly: Istanbul Atatürk Airport (IST) is the city's main international airport and less than 15 miles away from the heart of Old Istanbul. You can take a taxi, bus, or metro in to the city for a reasonable price. There is also the Sabiha Gökçen International Airport (SAW) on the Asian side, servicing mostly budget European airlines. Visa: Depending on your nationality, you may need a visa to enter the country (U.S. passport holders need one). You can either queue for it upon arrival before going through passport control, or apply and pay online prior to your trip.